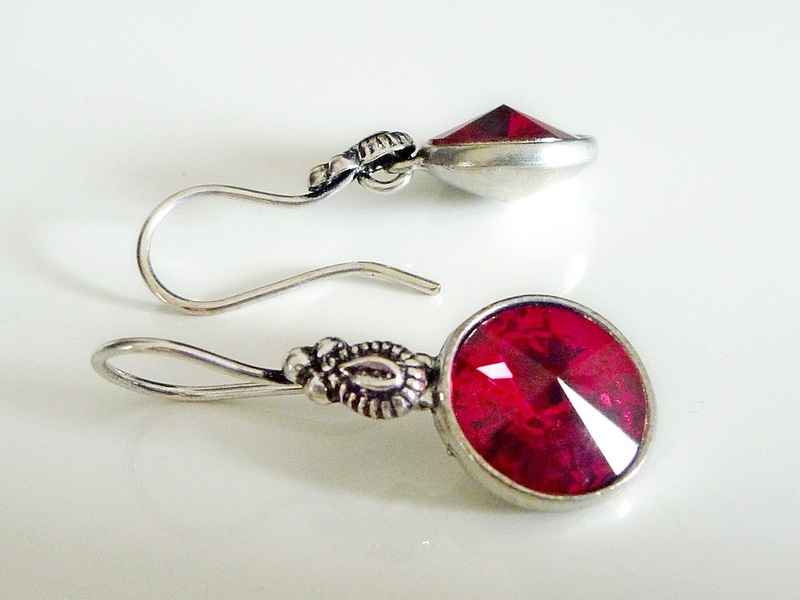 Wedding Jewellery design & bespoke orders welcome. This funky collection of quality glass beads incorporates a stunning larger deep red hand blown glass bead full of gorgeous bubbles. 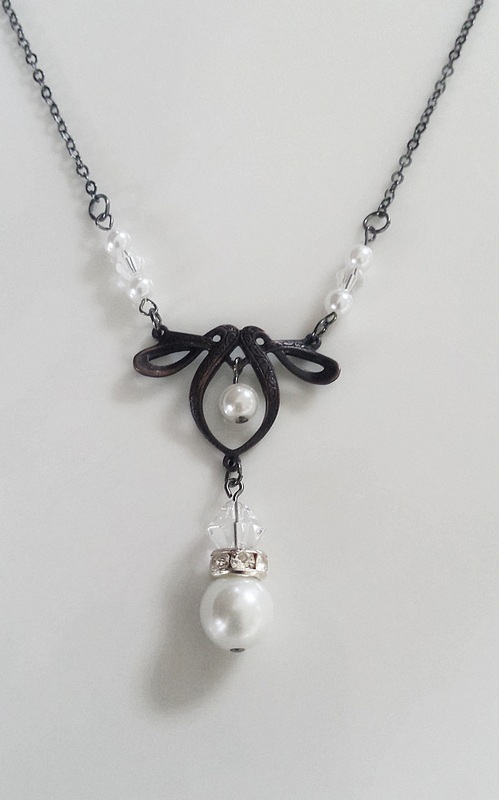 The total length of this necklace including the beads, cable chain and clasp is about 46cm for a fabulous shorter style that showcases theses smooth beads against your skin. I can alter this length on request. Just leave instruction at checkout of contact me if you have any questions. 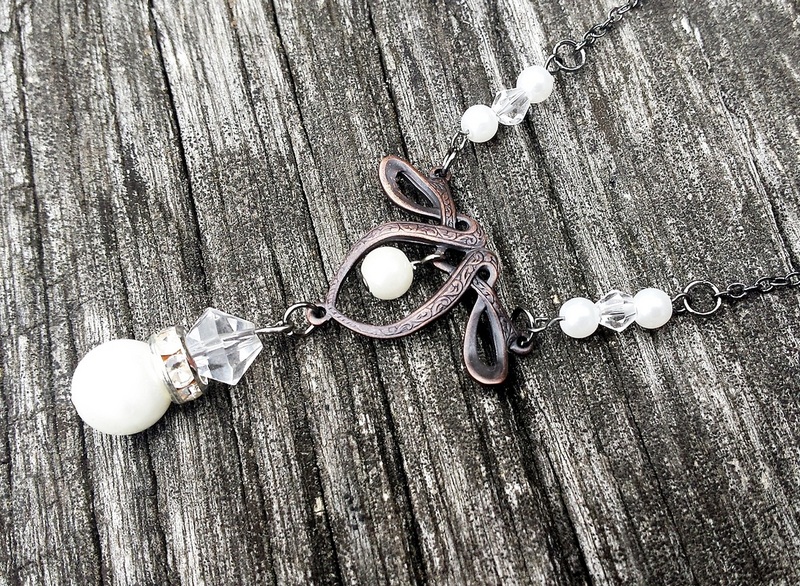 This gorgeous detailed blackened Art Nouveau connector hold a stunning combination of glossy pearlised beads and clear crystals. 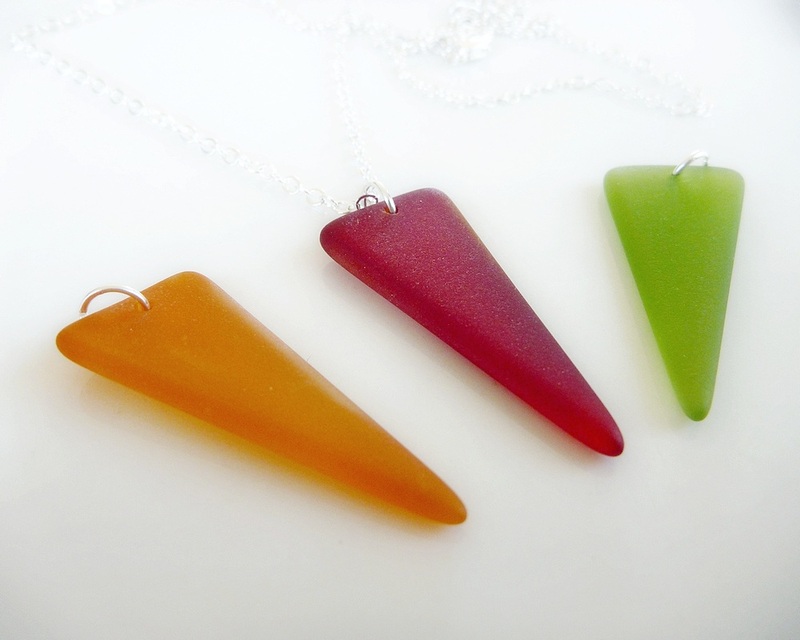 The total pendant drop is about 4.5cm. The dark chain including the connector, extra pearls and crystals loops at about 46-49cm. 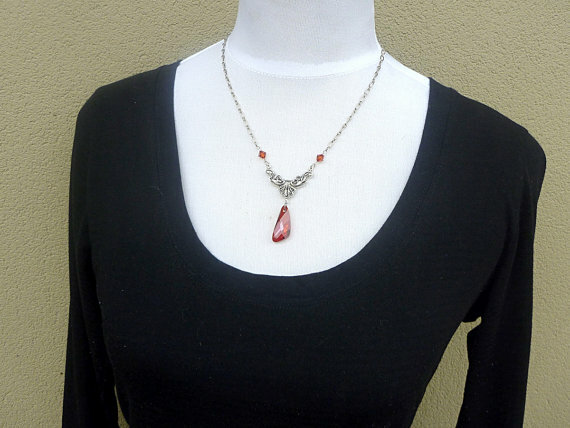 I can make it to any length you like, but it sits just above a deep scoop neckline on me. Contact me if needed. 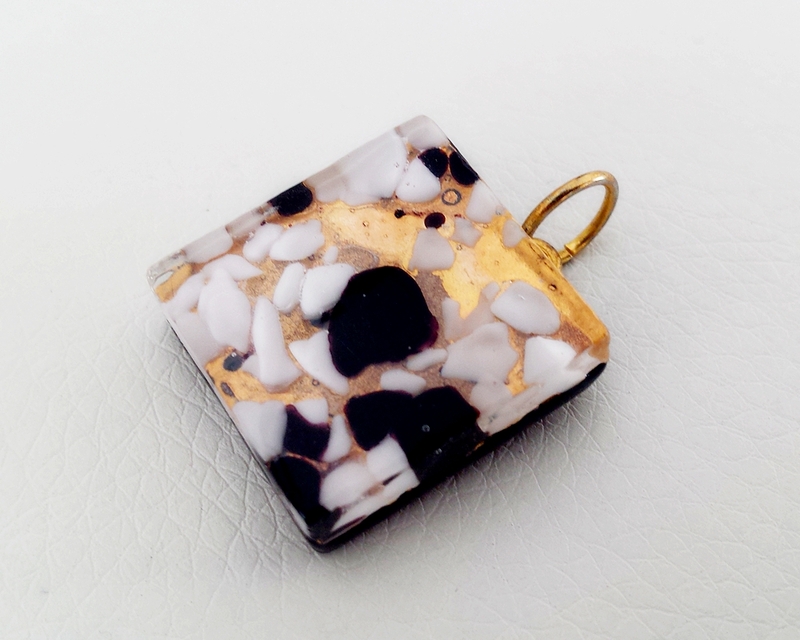 This 3cm long venetian glass pendant has a gorgeous shimmering depth of colour with a touch of gold foil. Really hard to capture its beauty in a photo. 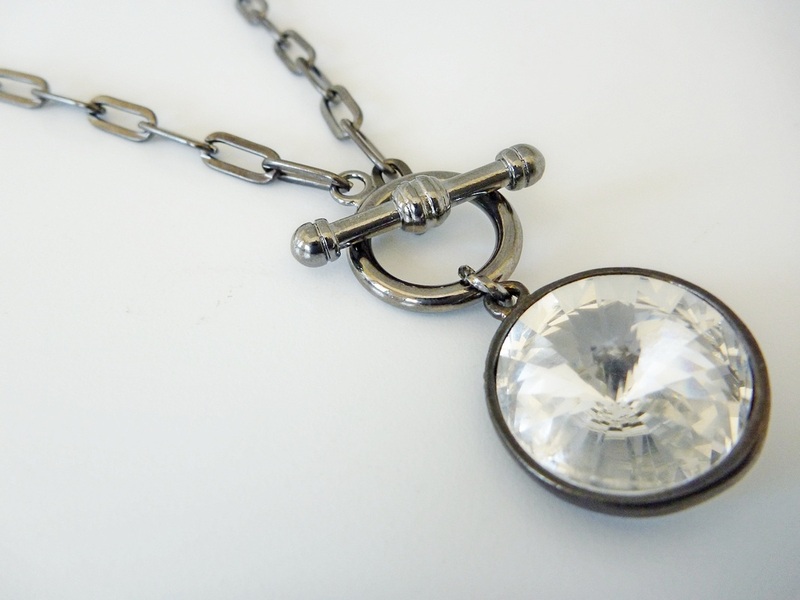 The top loop is large enough to easily slide onto your favourite chain or leather neck cord. The lettering on the back shows its authenticity. 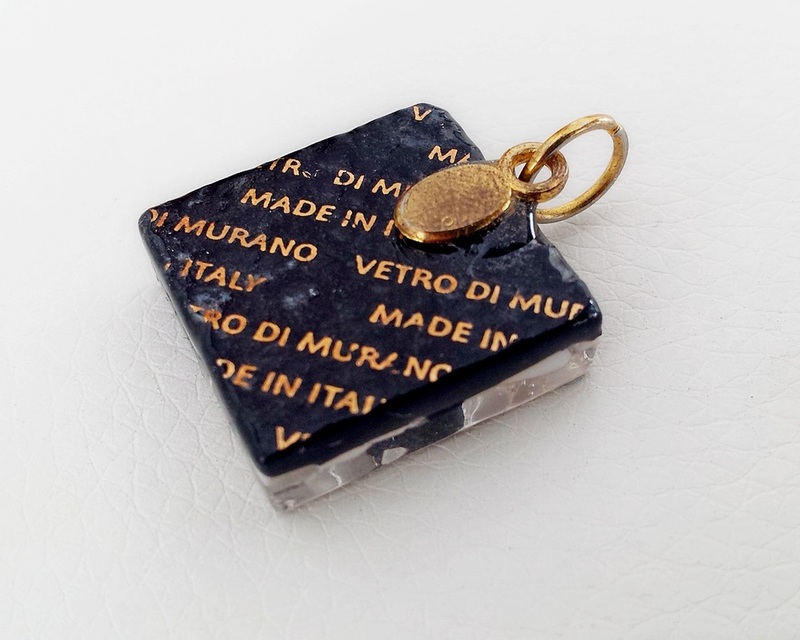 This 2cm square venetian glass pendant is stunning with its shimmering gold foil. The loop on the top is gold tone and large enough to easily slide onto your favourite gold chain or leather neck cord. 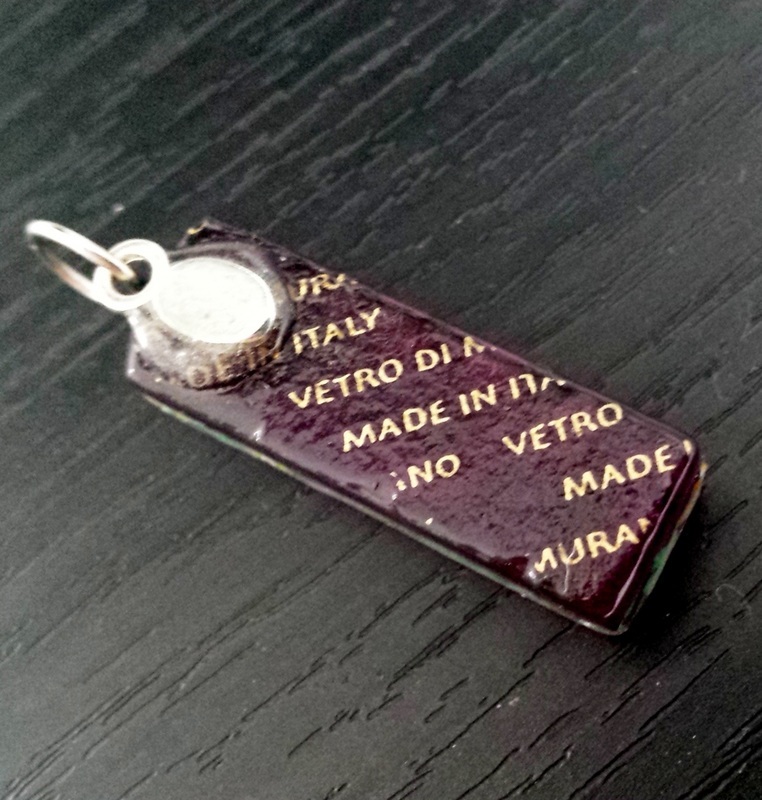 The lettering on the back shows its authenticity. 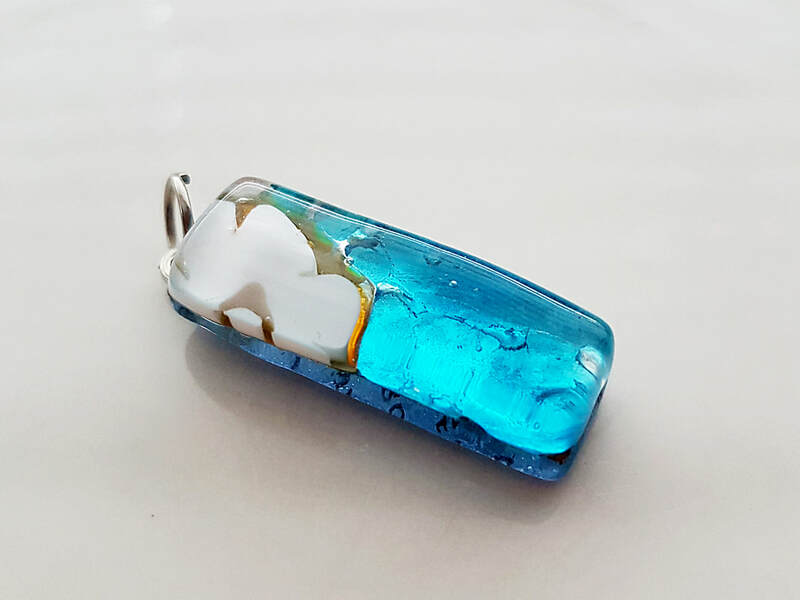 This 3cm long venetian glass pendant has a gorgeous mix of colours including shimmering gold flecks and Millifiori pieces. 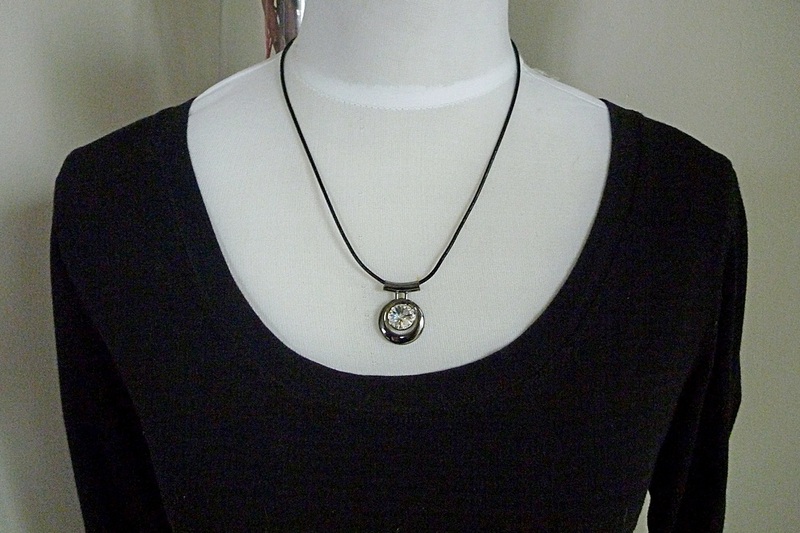 The loop on the top is large enough to easily slide onto your favourite gold chain or leather neck cord. 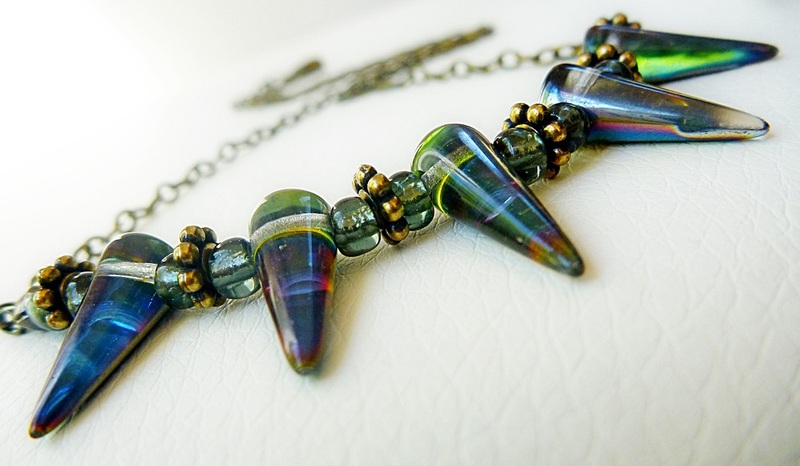 Five Stunning 17mm long Czech Glass Spike beads with a greenish gold & rainbow metallic flash to them. 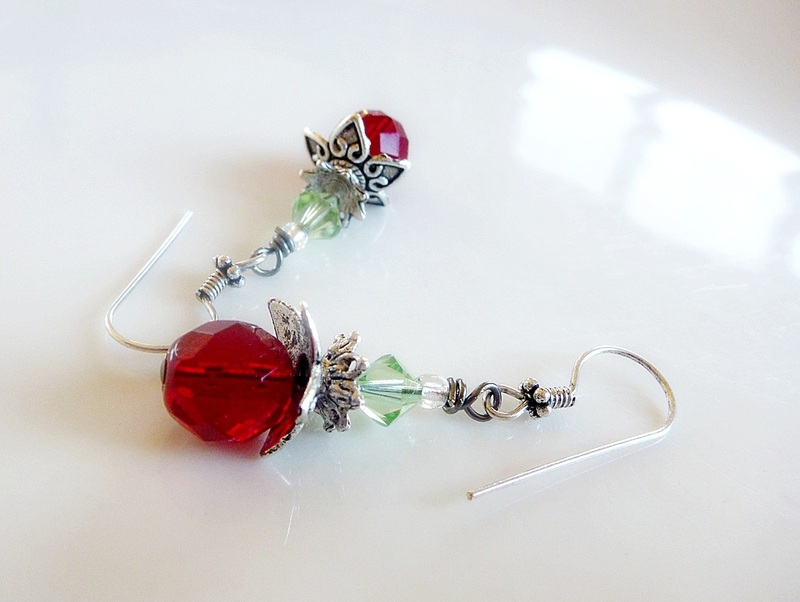 I have alternated them with quality glass seed beads and antiqued pewter beads. 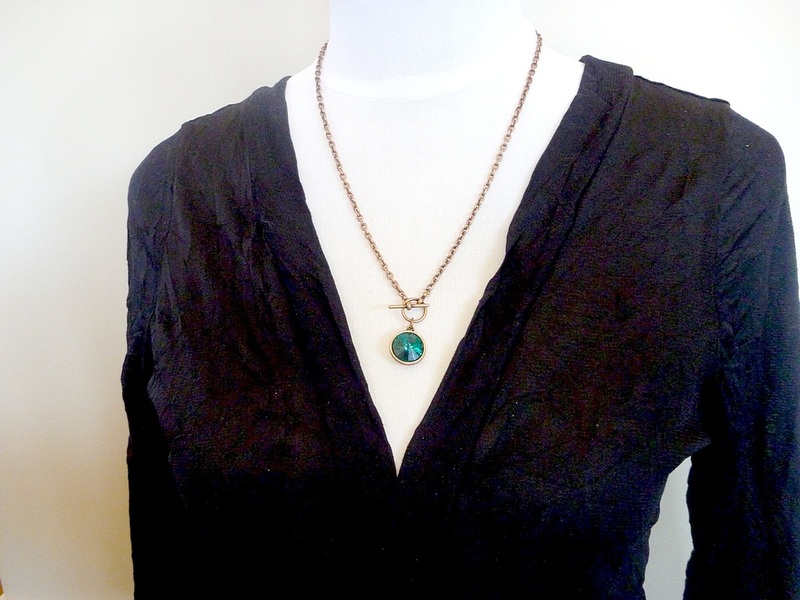 Stung from lead and nickel free antiqued brass chain. The total length of this 50cm. I can make it shorter or longer on request at no extra cost. Just contact me or leave instruction at checkout. 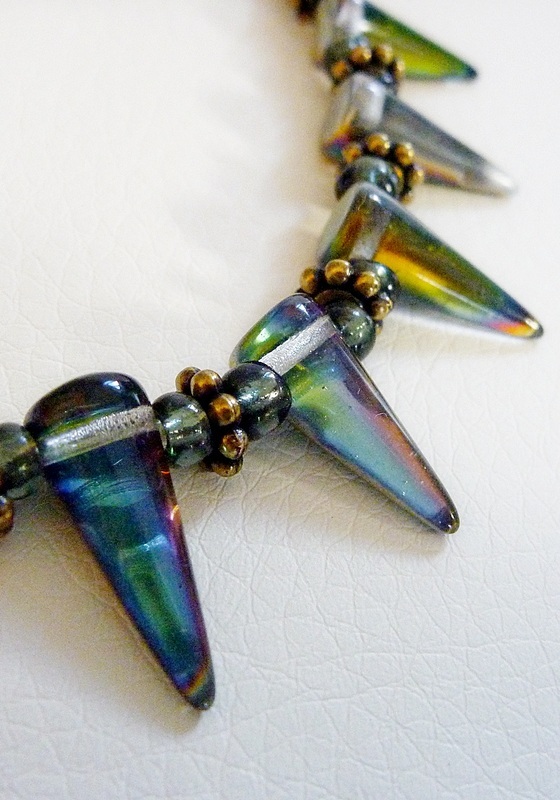 17mm long Czech Glass Spike beads with a greenish gold & rainbow metallic flash to them. 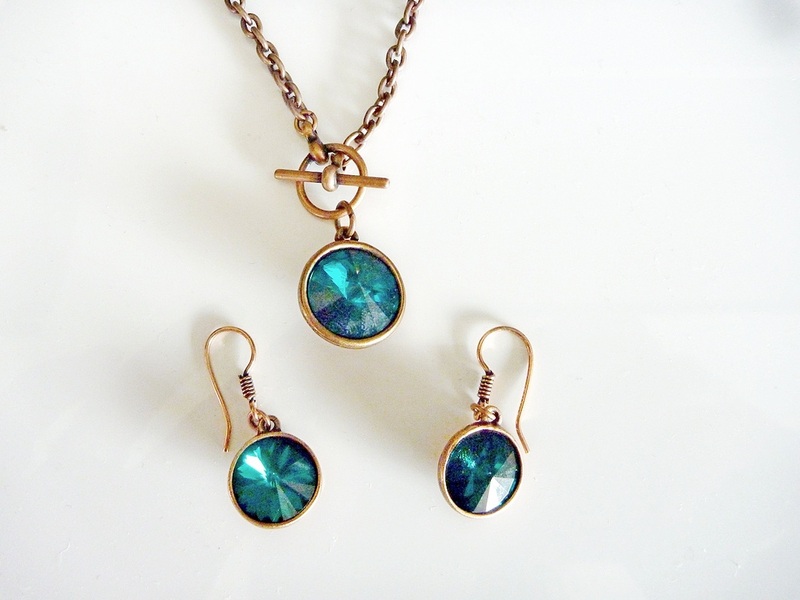 I have hand wrapped them with brass wire and another bead to match the necklace above. Hanging from antiqued brass french ear-wires. 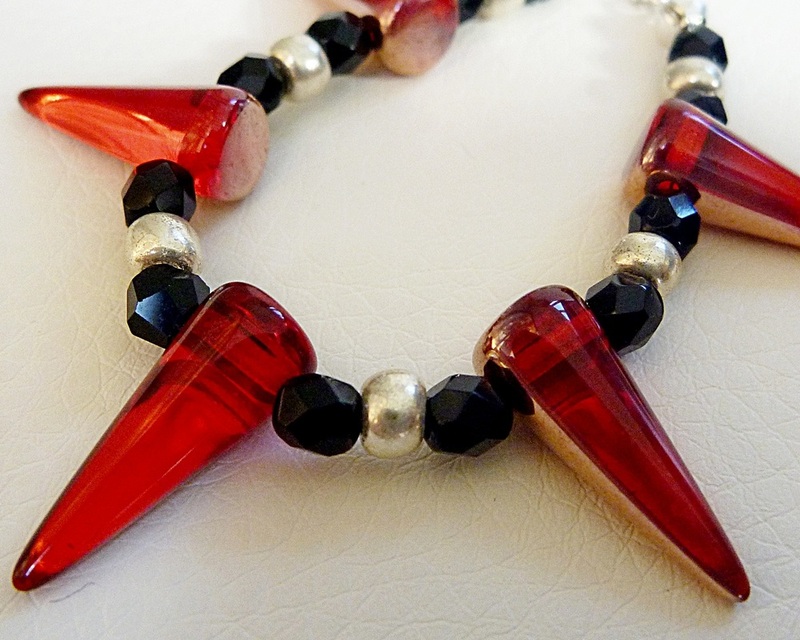 Five Stunning 17mm long Czech Glass Spike beads in a gorgeous metallic backed red. 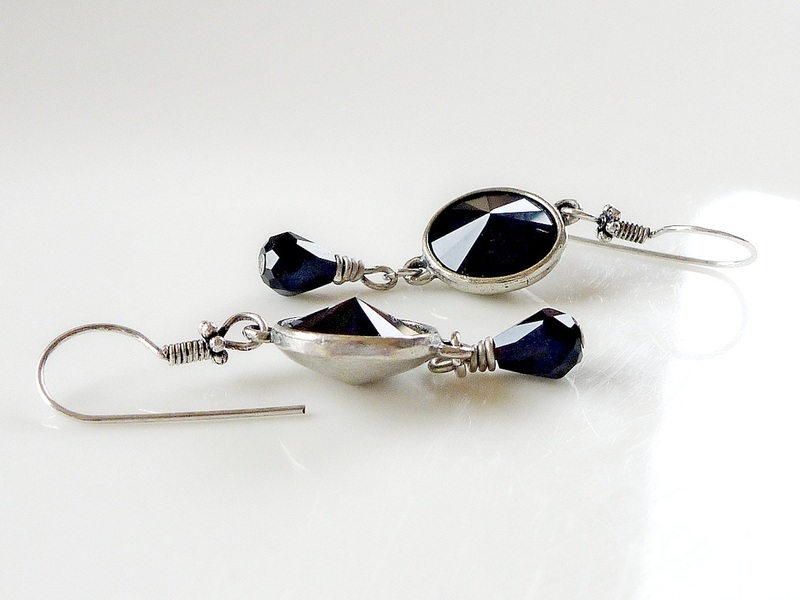 I have spaced them with quality Czech glass silver seed and multi faceted black beads. Stung from antiqued Silver cable chain. The total length of this approx 50cm. I can make it shorter or longer on request at no extra cost. Just contact me or leave instruction at checkout. 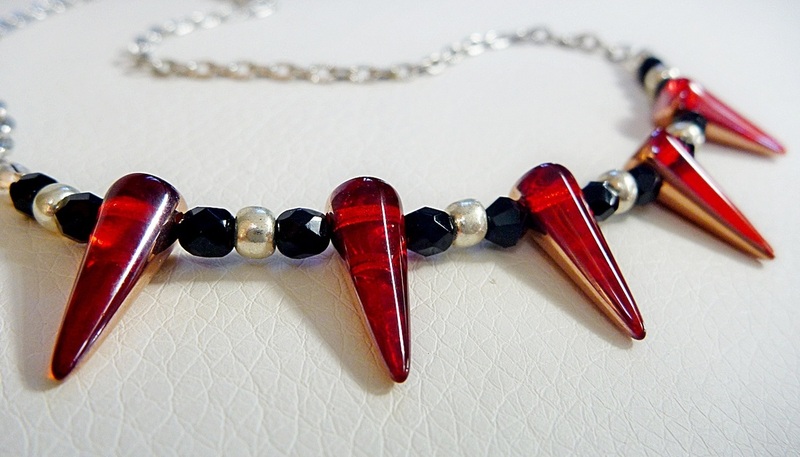 17mm long Czech Glass Spike beads in metallic foiled red. 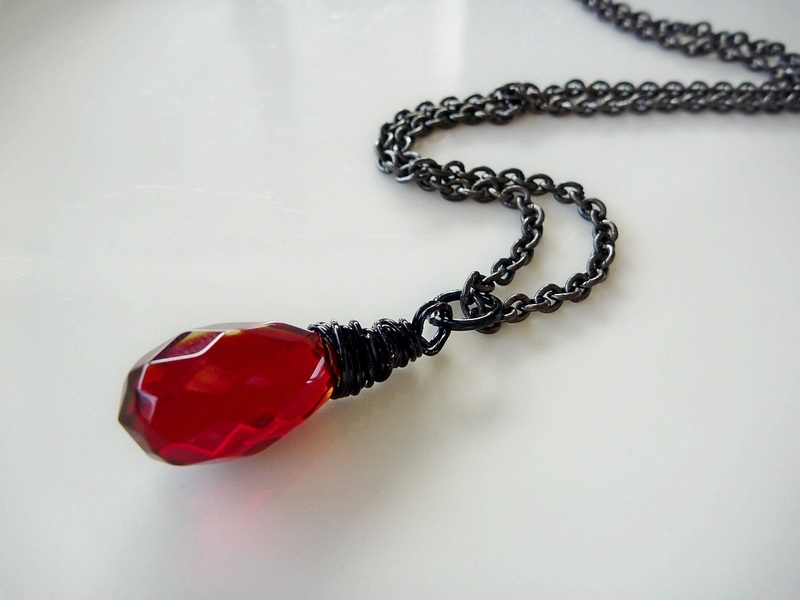 I have hand wrapped them with silver wire and a small black glass bead to match the necklace above. Hanging from french wrapped ear-wires. 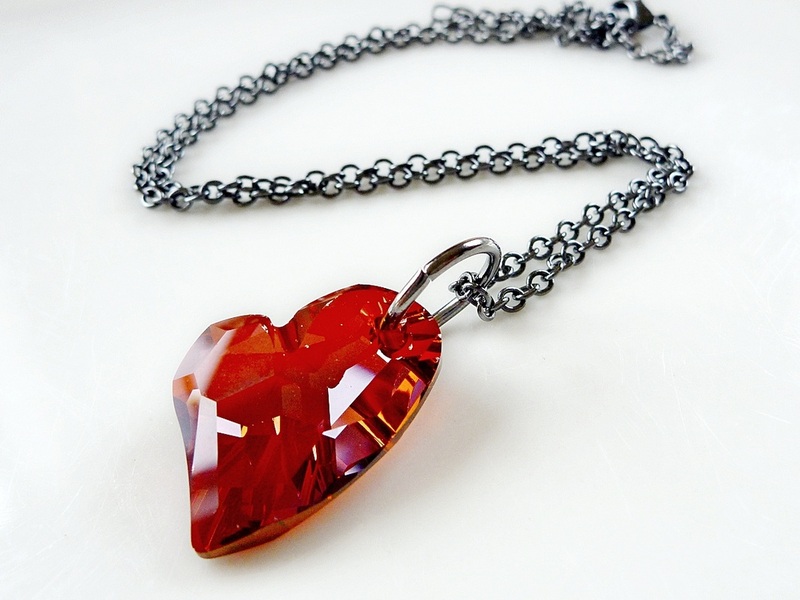 This gorgeous translucent faceted Crystal heart catches the light so easily. 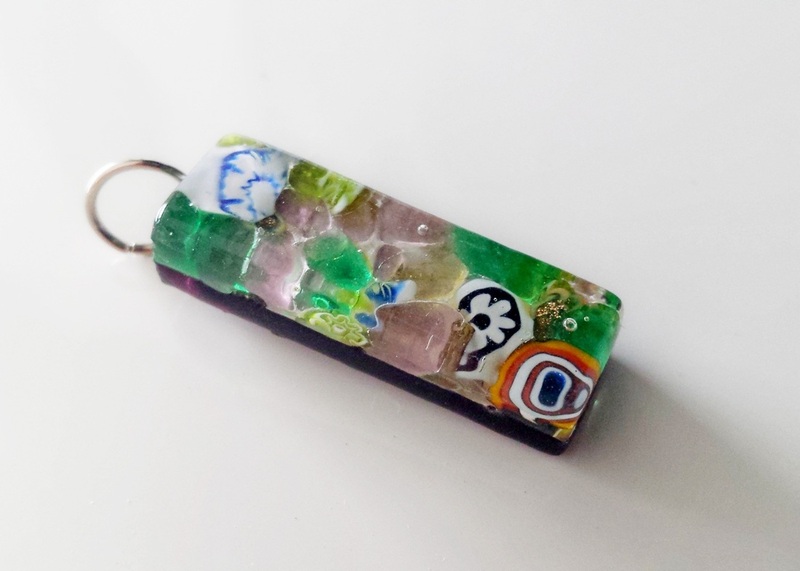 It is about 18mm long and I have hand twisted silver wire to create a funky pendant connector. Total drop of about 3.5cm. Strung on about 48cm of fine cable chain. 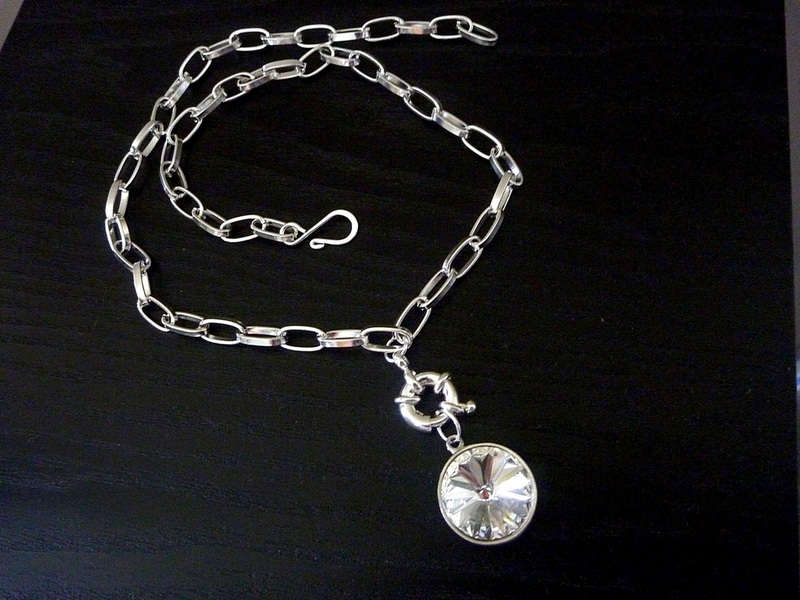 Approx 36 x 16mm on a 46-50cm silver cable chain. 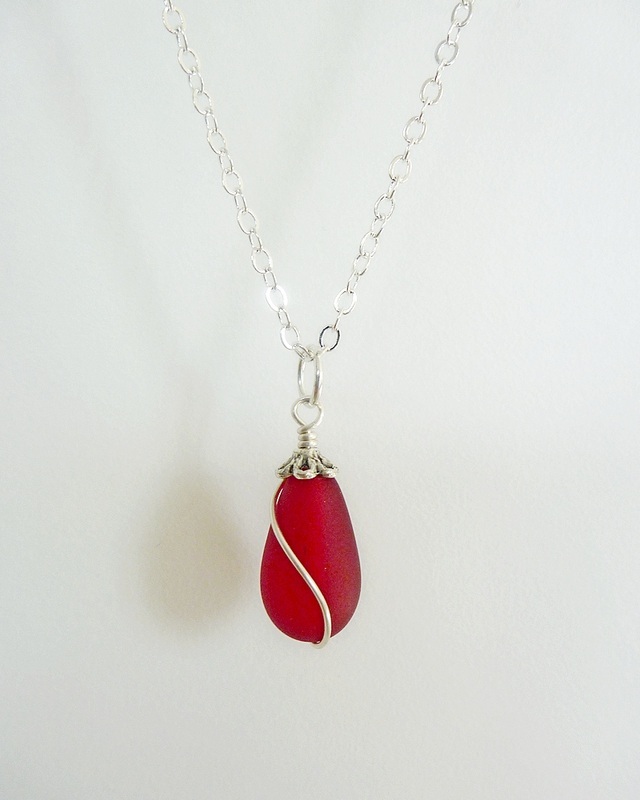 Approx 2cm long drops hand wrapped and strung from approx 48cm of silver cable chain. 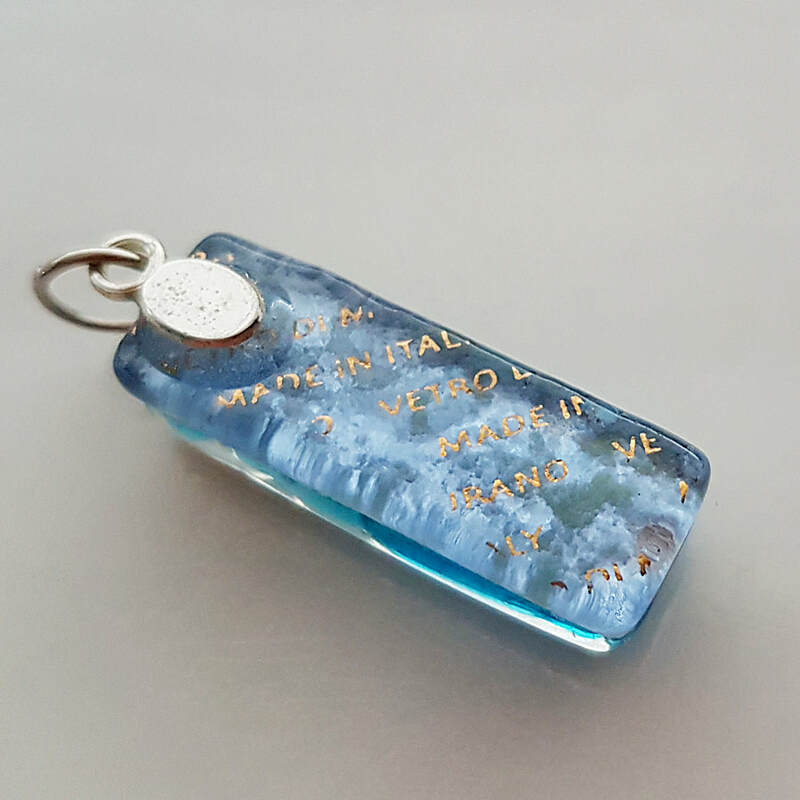 These wee teardrops are made from high quality glass materials to mimic sea stones, which are bits of glass worn down over years amongst the sand and surf. 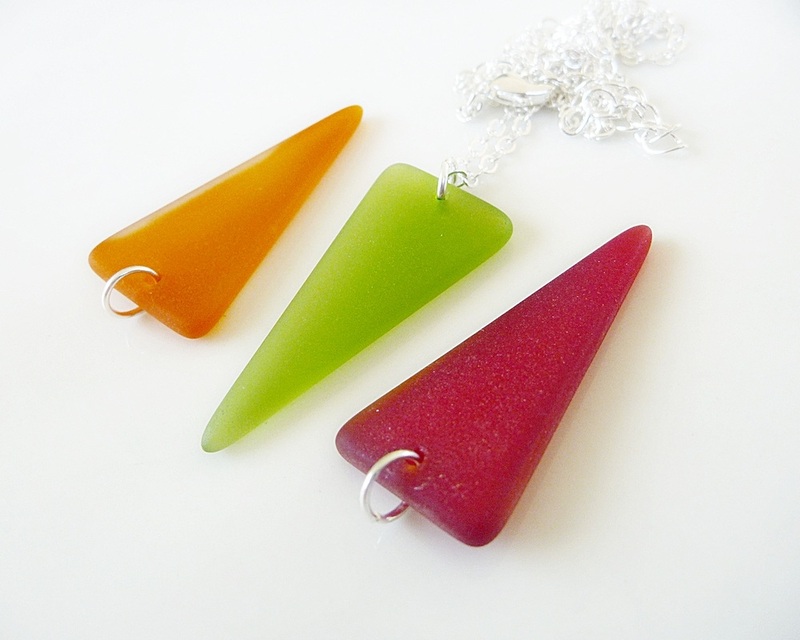 Gorgeous opaque colour. Available in Tangerine or Raspberry. 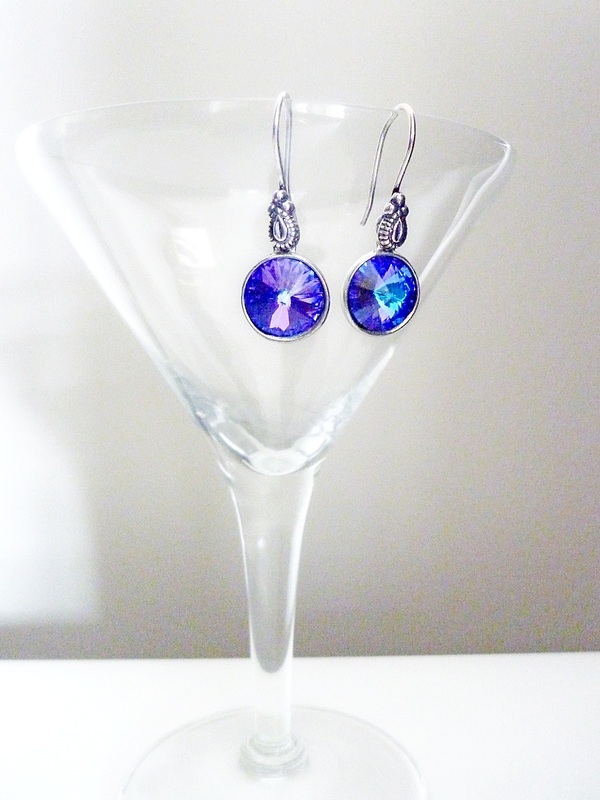 This gorgeous 12mm foil backed Swarovski Crystal forms a faceted peak front & back for extra stunning sparkle. It is recessed into a custom made gunmetal coloured pewter setting with a slide tube hanger. 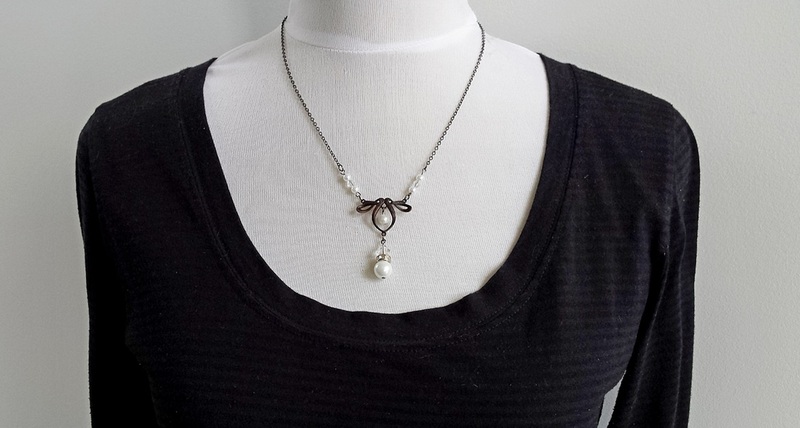 Strung on 46-50cm of matching snake chain with a small extension chain for adjustment. The sparkle of the crystal against the dark setting is gorgeous. 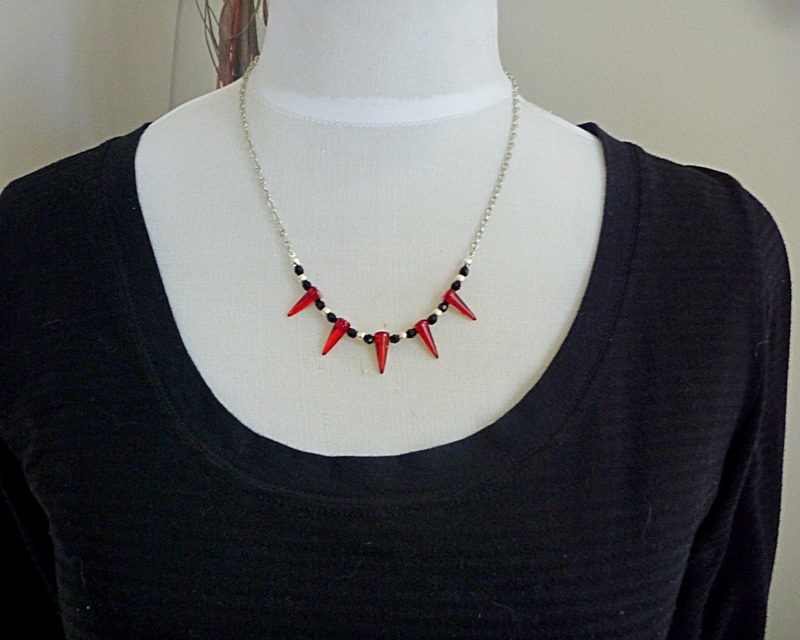 Wonderful with your favourite LBD or any other outfit. 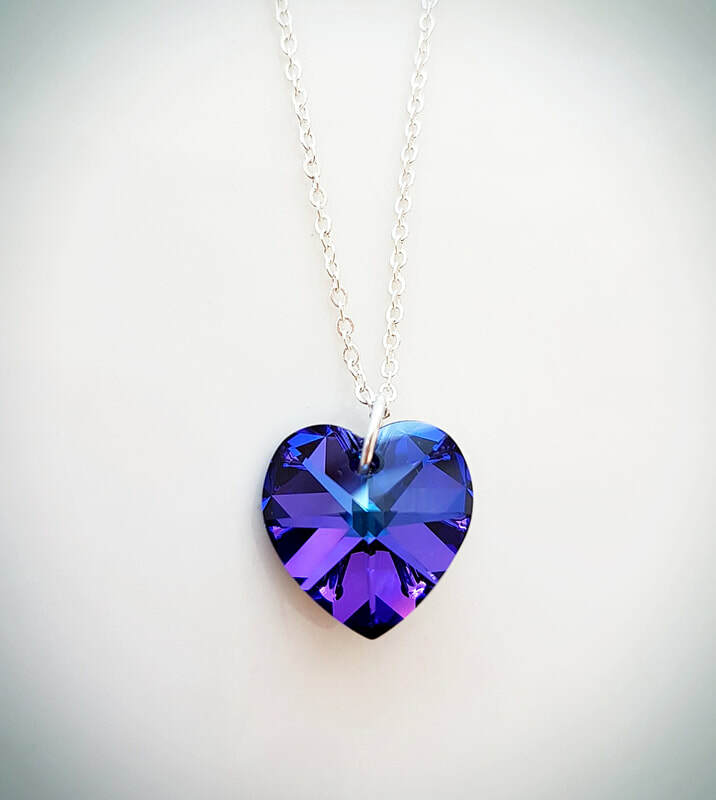 A breathtaking 18mm x 18mm Austrian Swarovski Crystal Heart in Heliotrope. The colour changes through all many shades of Teal, Blue, Indigo and Purple. Very hard to capture the colour intensity. 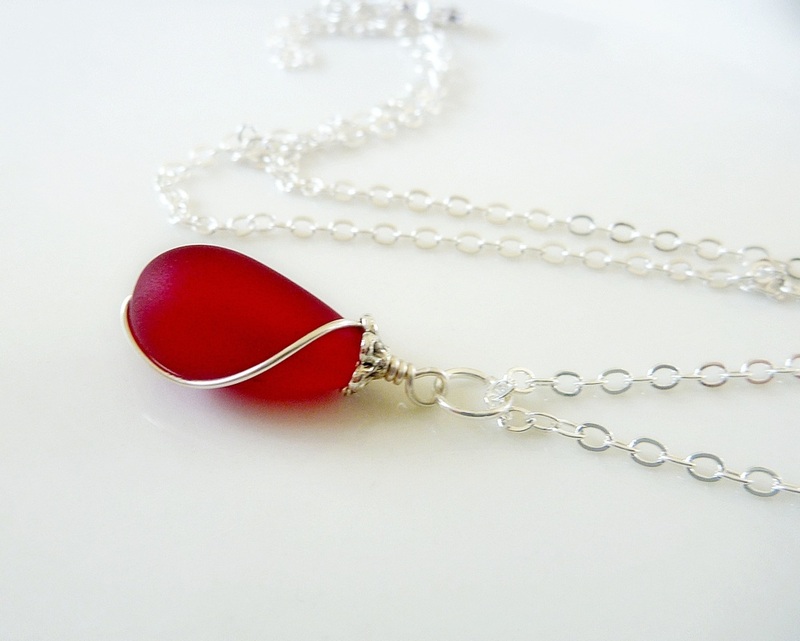 Comes on a fine 46cm silver tone chain. Please don't let this crystal come in contact with water, perfume or lotions. 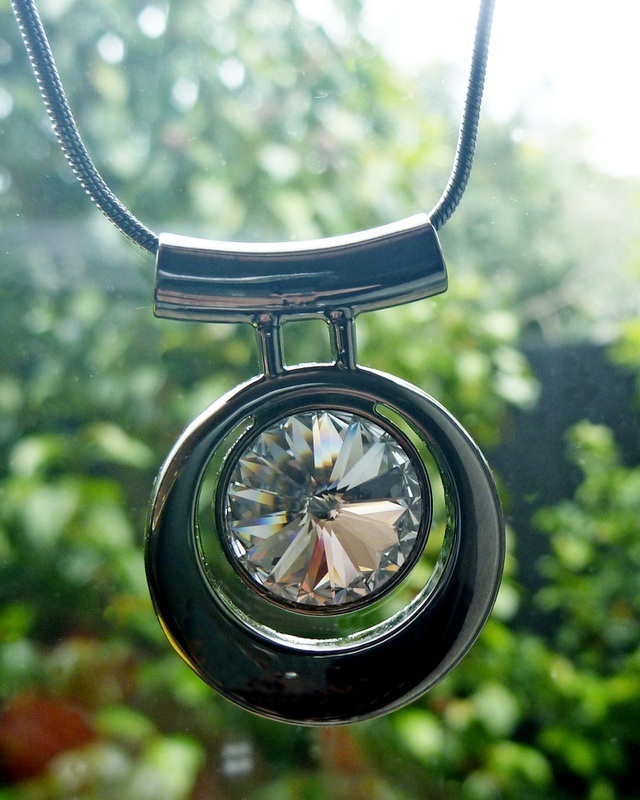 A beautifully faceted genuine Swarovski rivoli set into a round 2cm wide silver bezel. The crystal forms a peak in the centre with the facets radiating outwards. I have then attached this sparkly stunner to a silver bolt ring clasp so it can be replaced with another pendant if wanted. 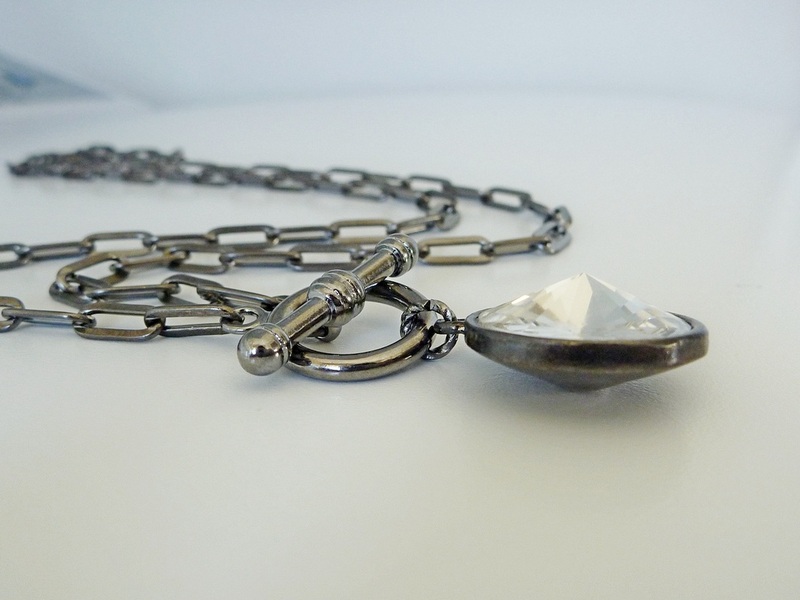 The funky chunky silver chain is about 50cm long. 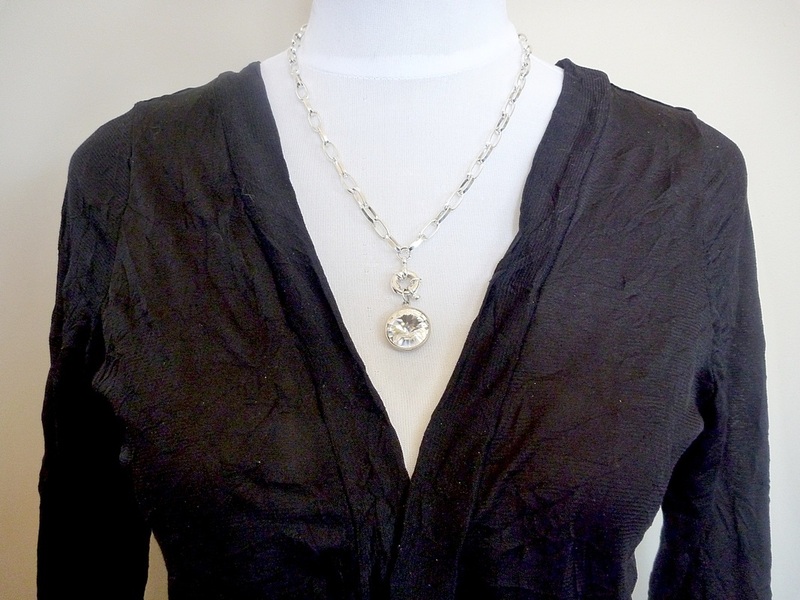 It can be worn shorter by moving the hook clasp along a few links. A funky combination of crystals. 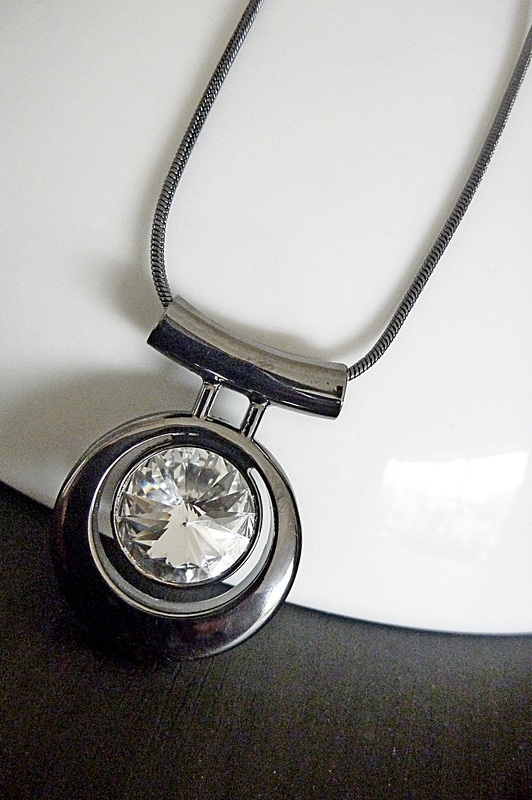 The round swarovski rivoli crystal forms a peak front and back and sits in an antiqued pewter setting. 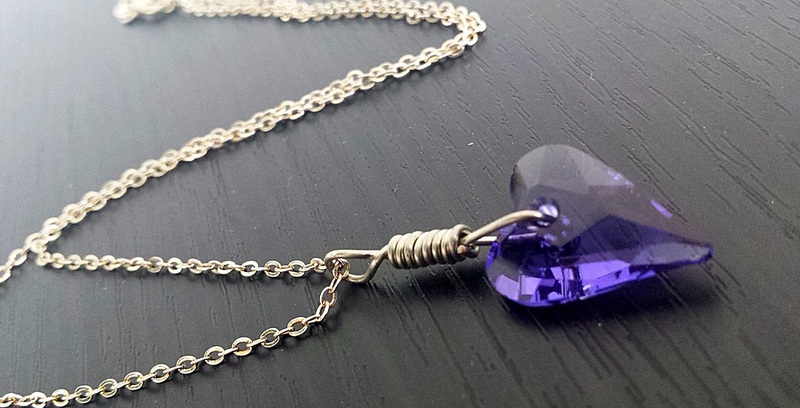 I have hand wrapped the drop crystal that swings at the bottom and it all hangs off hand twisted silver earwires. 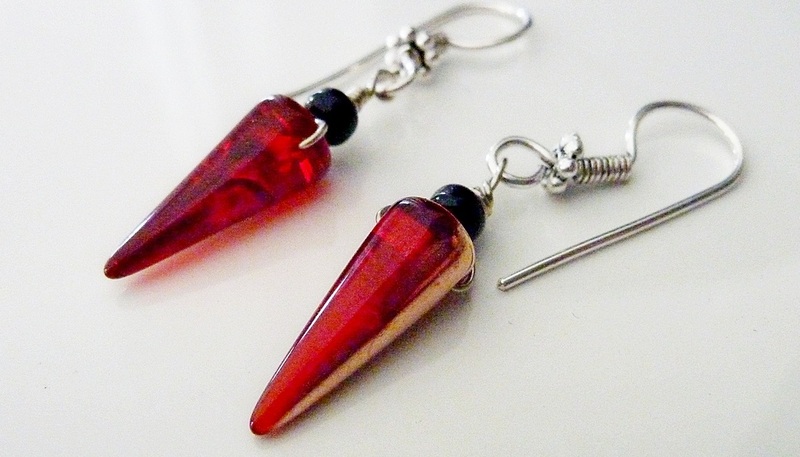 Total dangle length from the top of the earwire is 5cm. 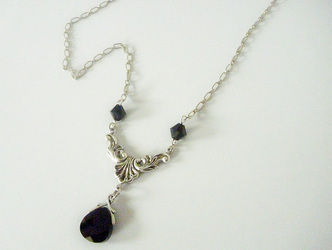 This divine piece could be worn as evening or bridal wear or just to feel uber chic casual with jeans. 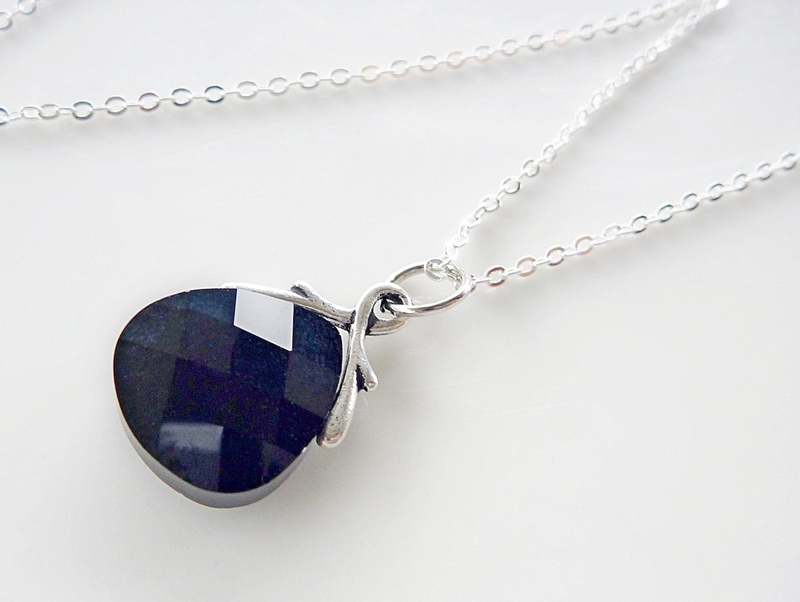 The muli faceted jet black swarovski ctystal is stunning, much more light catching than my photo shows. I have fitted it to a gorgoeus setting and strung it from a wonderfully detailed 3.5cm wide antiqued silver filigree connector. 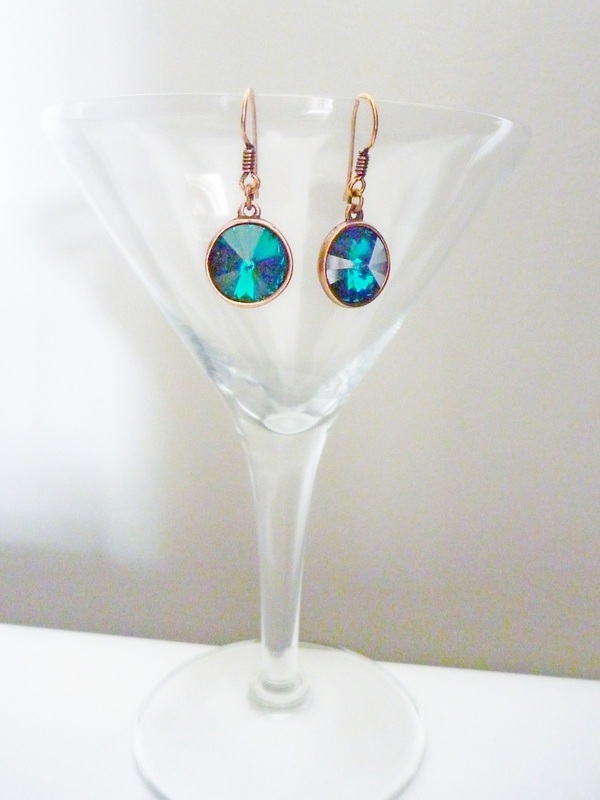 Two matching glass bicones finish off the wow factor. Adjustable by moving the clasp along the links, but happy to make one to a certain length. 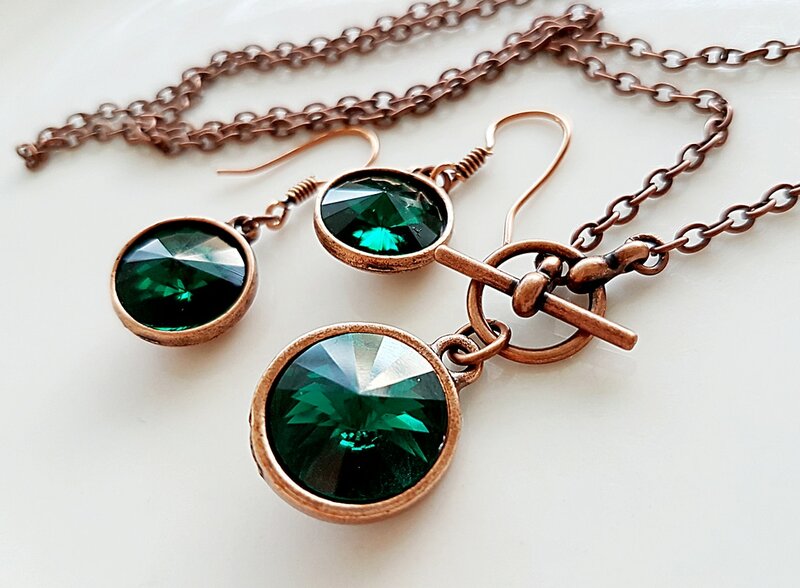 A beautifully faceted genuine Swarovski rivoli set into a round 1.7cm wide antiqued copper bezel. 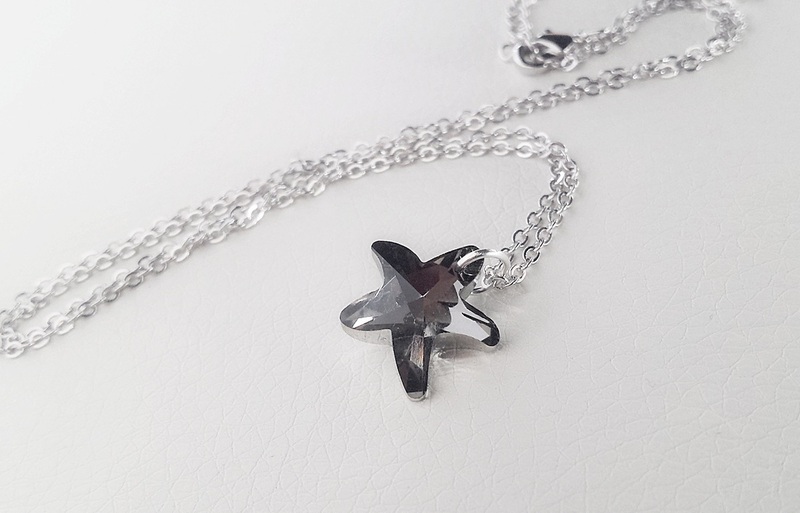 The crystal forms a peak in the centre with the facets radiating outwards. 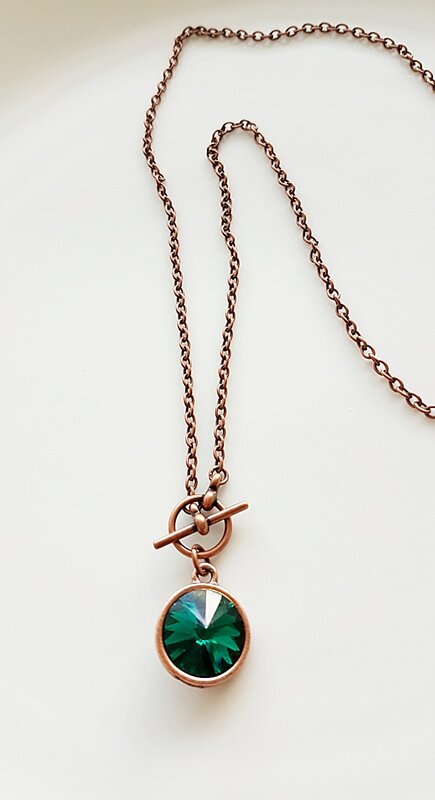 I have then attached this sparkly stunner to a funky central toggle clasp and matching antiqued copper chain. The chain is about 50cm long. The photo does not do it justice! Stunning 12mm swarovski rivoli crystals that form a peak front and back for amazing light catching properties and colour depth changes. Nestled into purpose made settings and strung on antiqued copper tone ear wires. total drop length from the top of the ear-wire is approx 3.5cm. 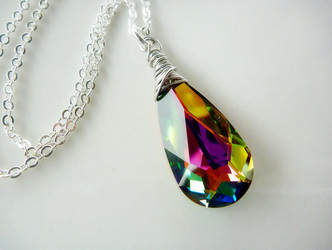 A breathtaking swarovski teardrop carefully hand wrapped by me. This is about 2.8cm long and gives off unbelievable colours. The figaro chain is about 60cm long, but I can make it to any length on request. The other chain shown is a fine cable chain about 48cm long as another option - You choose. The way it catches the light is stunning! 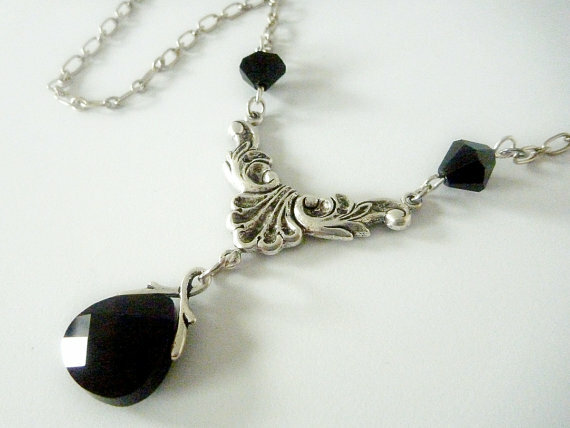 A great piece to wear with that little black dress or even as a bride on the big wedding day. Imagine the bridesmaids all having one of these to wear on the day, or as a perfect thankyou gift for their wonderful support and friendship. 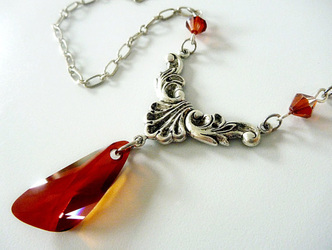 The muli faceted copper red swarovski crystal is stunning, much more light catching than my photo shows. I have strung it from a wonderfully detailed 3.5cm wide antiqued silver filigree connector. 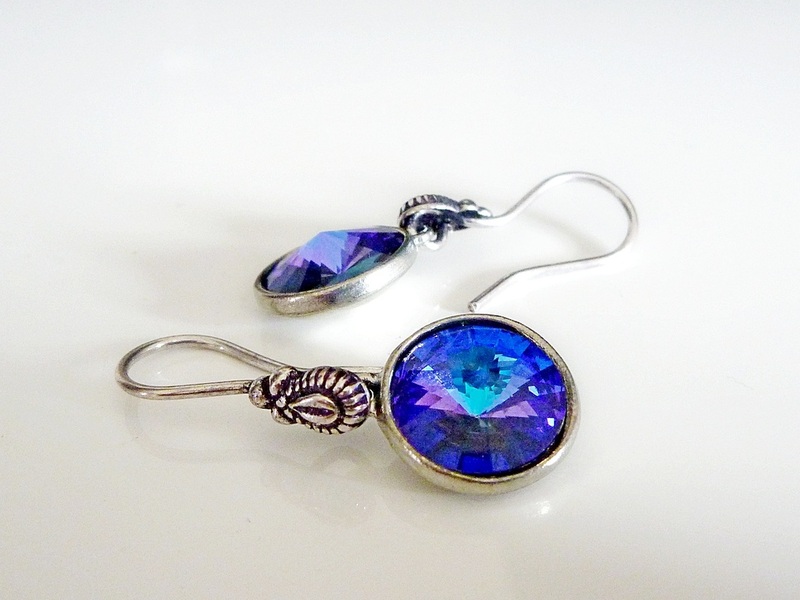 Two matching swarovski bicones finish off the wow factor. 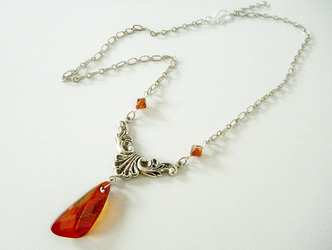 See my other listings for necklaces that incorporate stunning swarovskis. 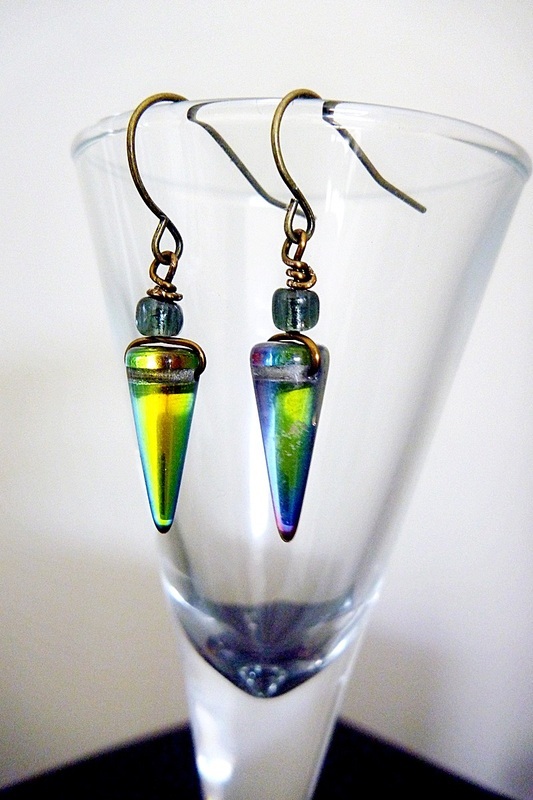 Both faceted crystal glass drops are gorgeous. Choose your colour. 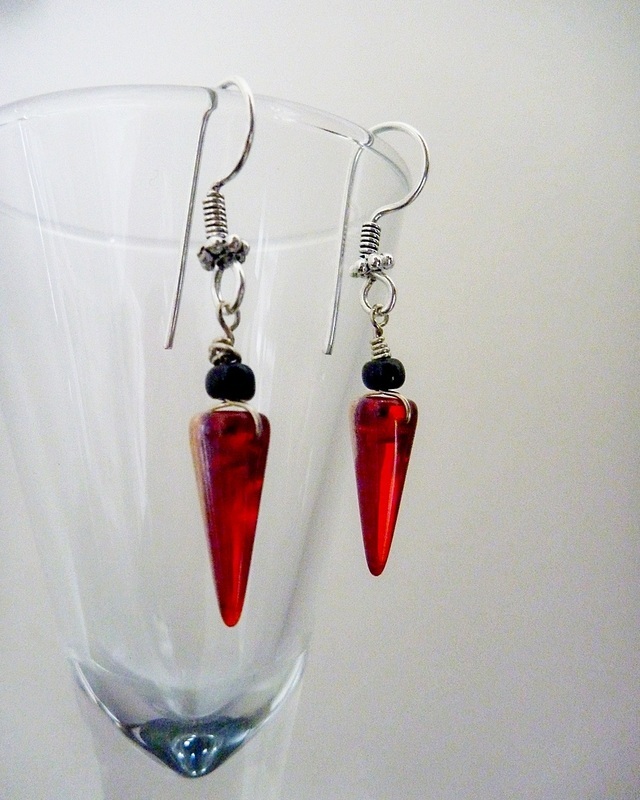 I have hand wrapped them in black and strung it on a lovely black chain. I think the strong colours with the black are quite striking. The chain is 46cm long, I can add an extension chain on request or you can have the much longer version up to about 90cm on request. 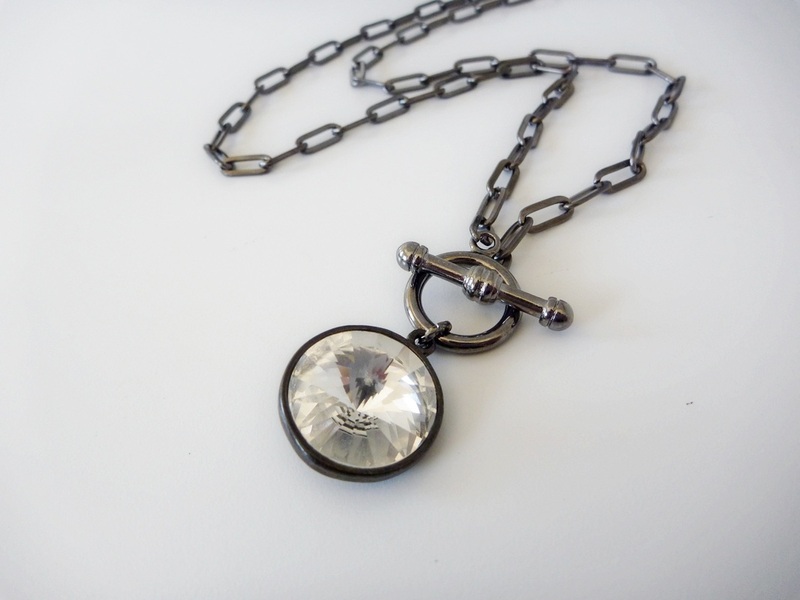 A beautifully multi faceted genuine Swarovski rivoli set into a round 2cm wide gunmetal silver bezel. 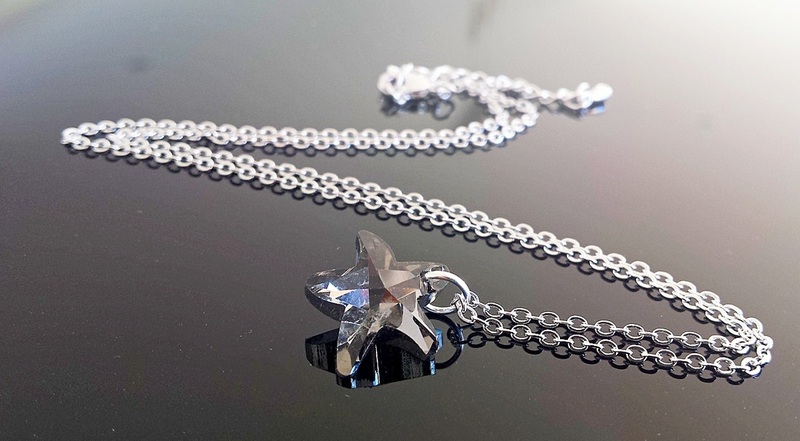 The crystal forms a peak in the centre with the facets radiating outwards and catches the light effortlessly. 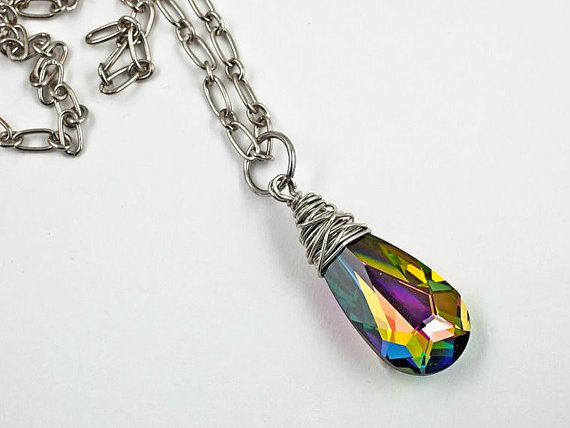 I have then attached this sparkly stunner to a funky front toggle and funky chunky matching chain that is about 70cm long. I can make this to any length required, longer or shorter, just ask. Glamour cool with jeans and a summer T or winter merino as well!. 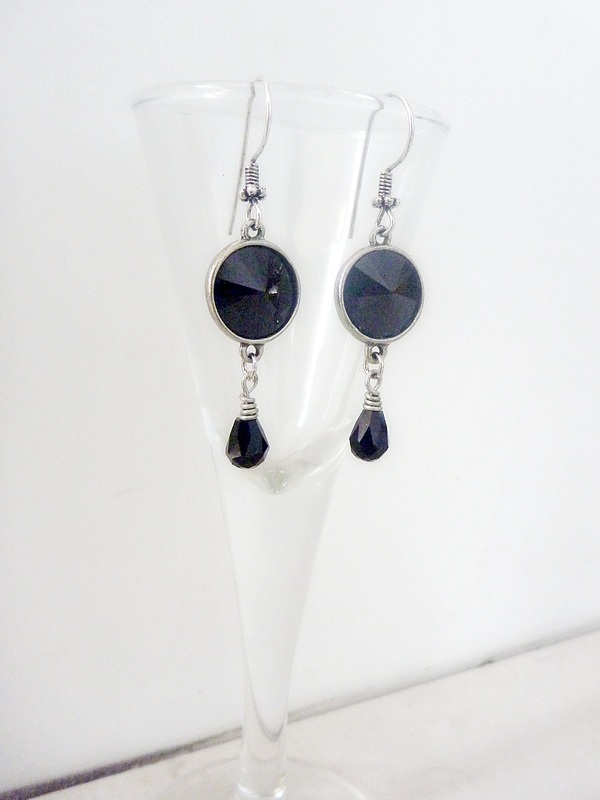 Gorgeous jet black Austrian Swarovski crystals set in antiqued silver pewter bails and hung from fine earwires that have a funky twist detail. 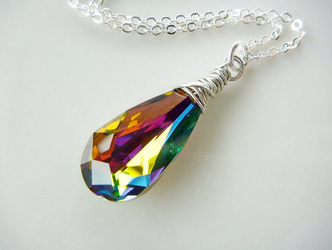 Total length from the very top of the wire to the bottom of the faceted crystal is approx 4cm. 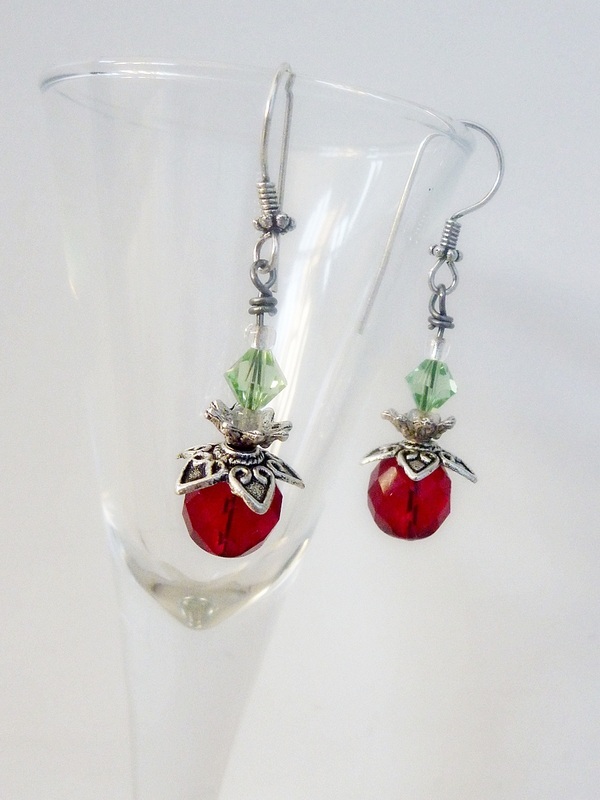 I can provide more than one set of these for a bridal party. Gorgeous to wear to a school ball, or just uber chic glam with jeans and high boots. 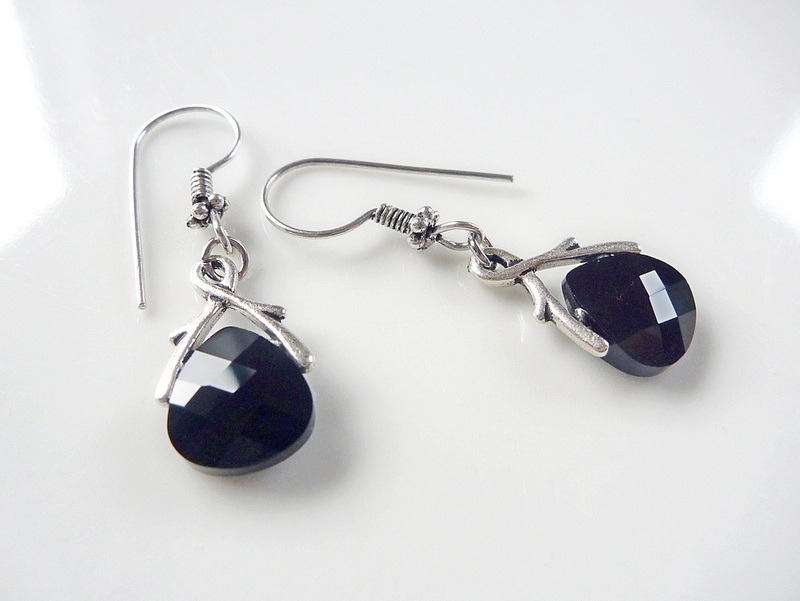 this is a very gorgeous wee jet black Swarovski crystal, 15x14mm faceted briolette. Austrian crystal is simply the best quality. I have hung it from a lovely antiqued silver ice-pick bail and comes on a standard 46cm fine cable chain. 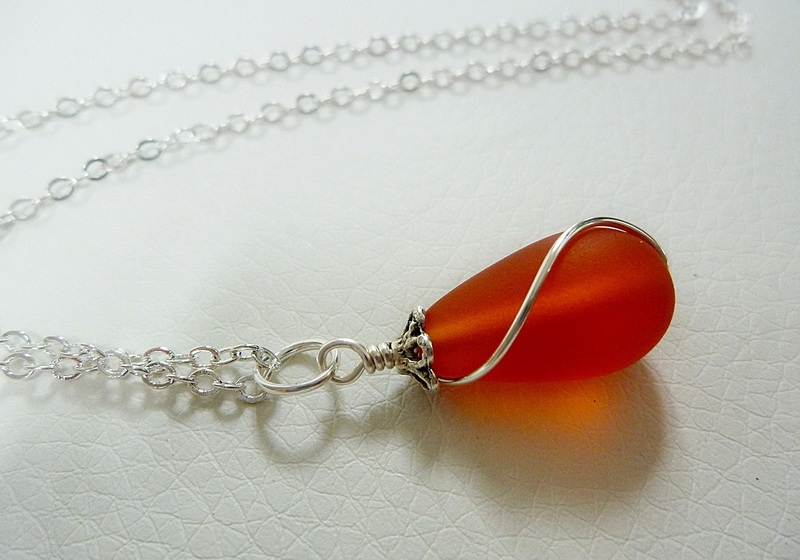 Due to its nature, and the fact that it is a crystal, it does need to be handled with some care. 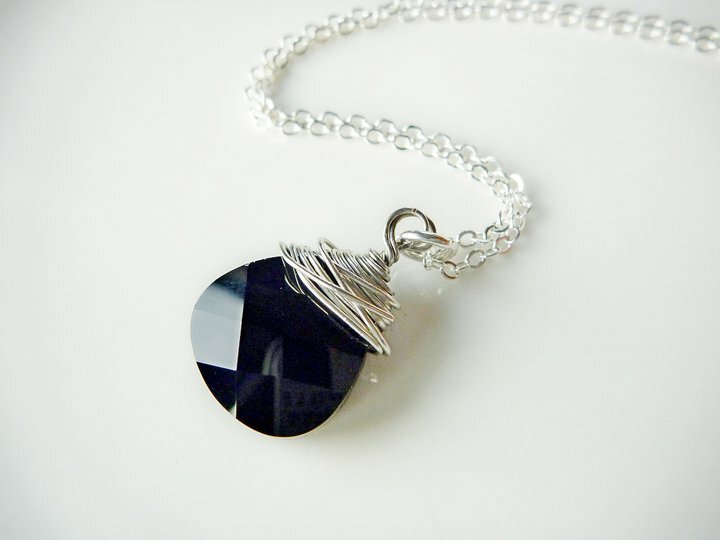 I have hand wrapped this very gorgeous wee jet black Swarovski crystal, 15x14mm faceted briolette. Austrian crystal is simply the best quality. Comes on a standard 46cm fine cable chain. 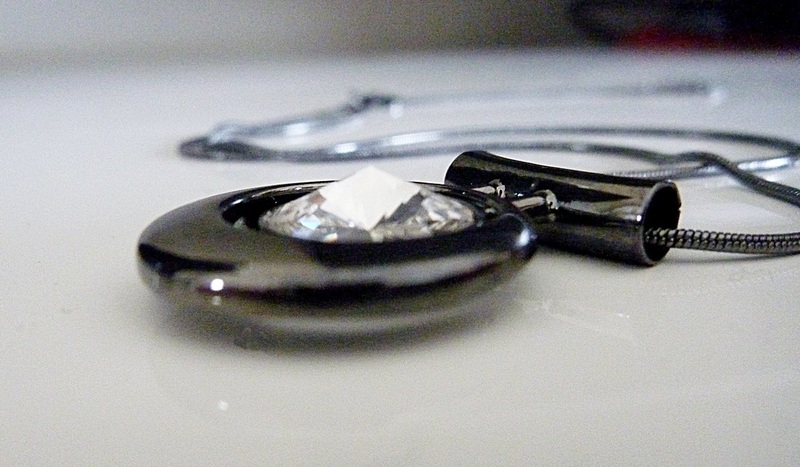 Due to its handcrafted nature, and the fact that it is crystal, it does need to be handled with some care. 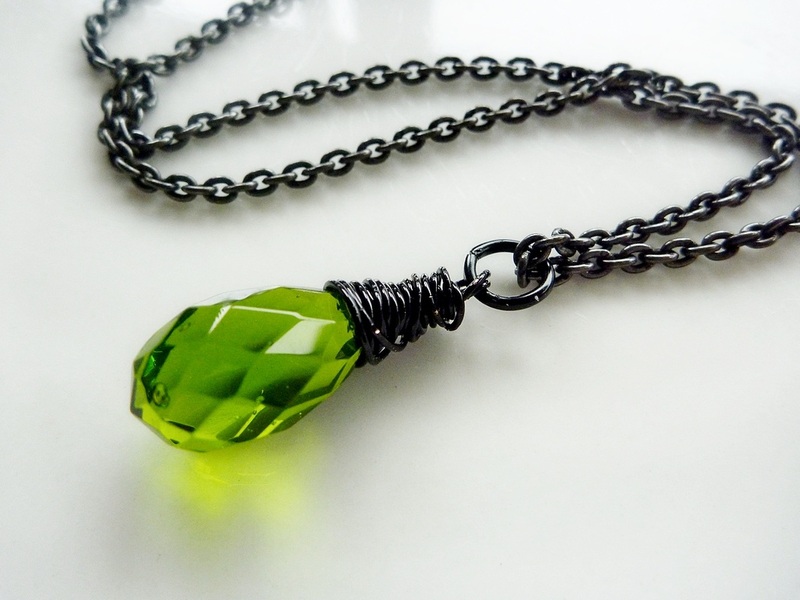 Stunning Czech fire polished crystal glass beads in deep red combined with peridot green swarovski crystals and antiqued silver bead caps. 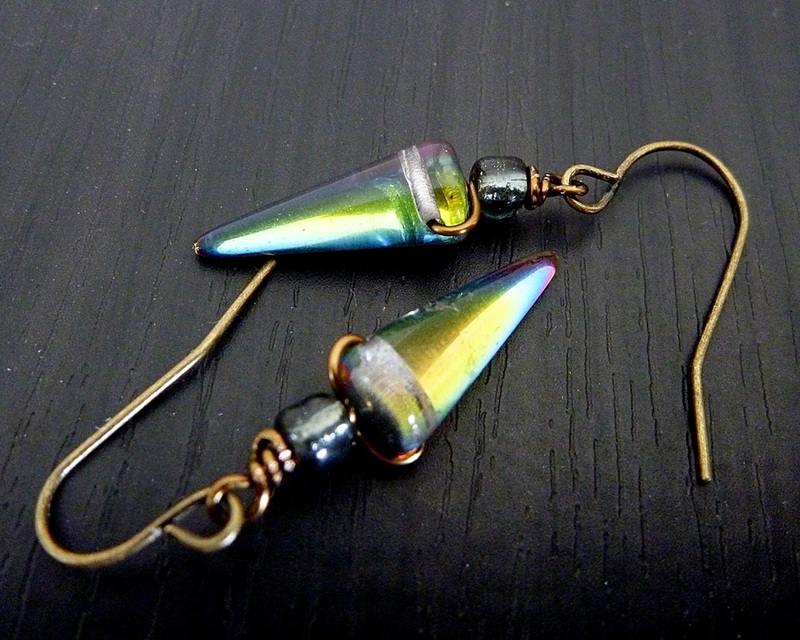 Strung on funky ear-wires with a twist. 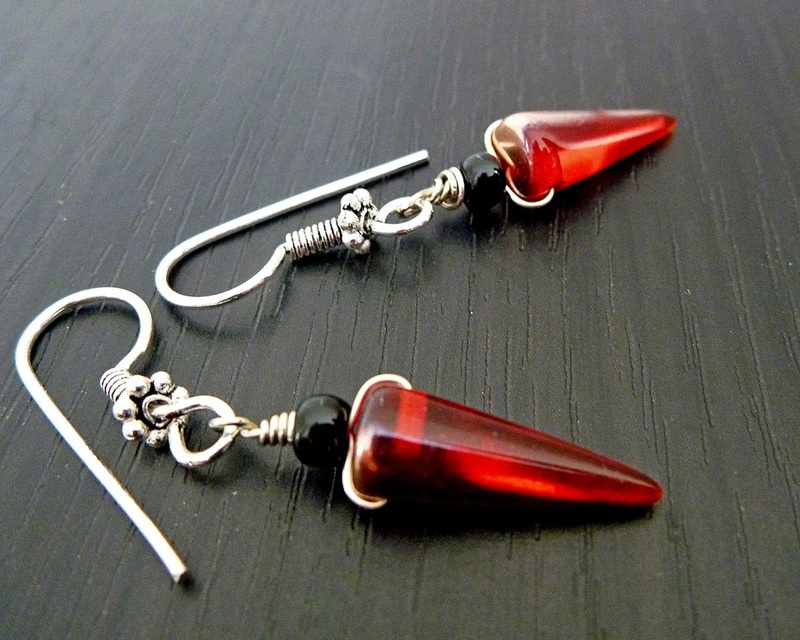 They hang approx 4cm from the top of the curve in the ear-wire. The facets of the crystals catch the light effortlessly. A striking combination. 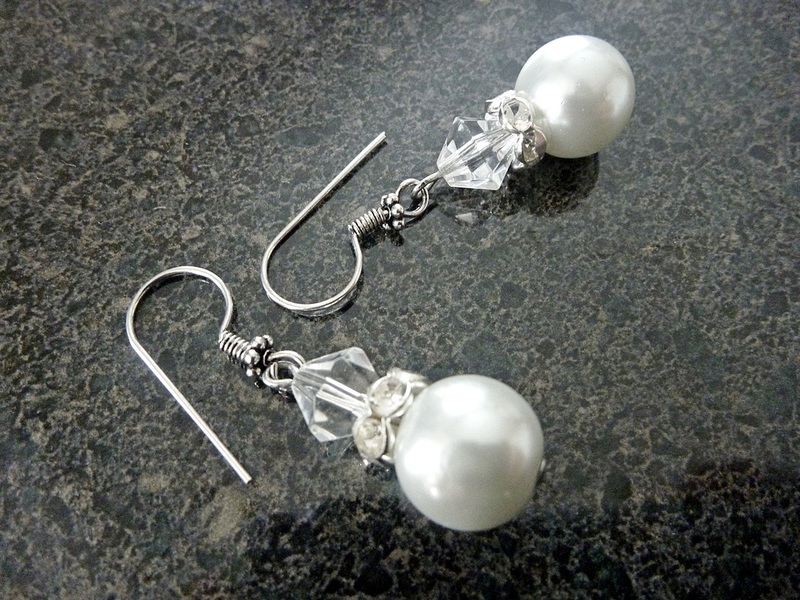 Gorgeous Lustrous white glass pearls hung with various crystals on fine earwires with a funky twist. Total length from the very top of the wire to the bottom of the pearl is approx 4.2cm. 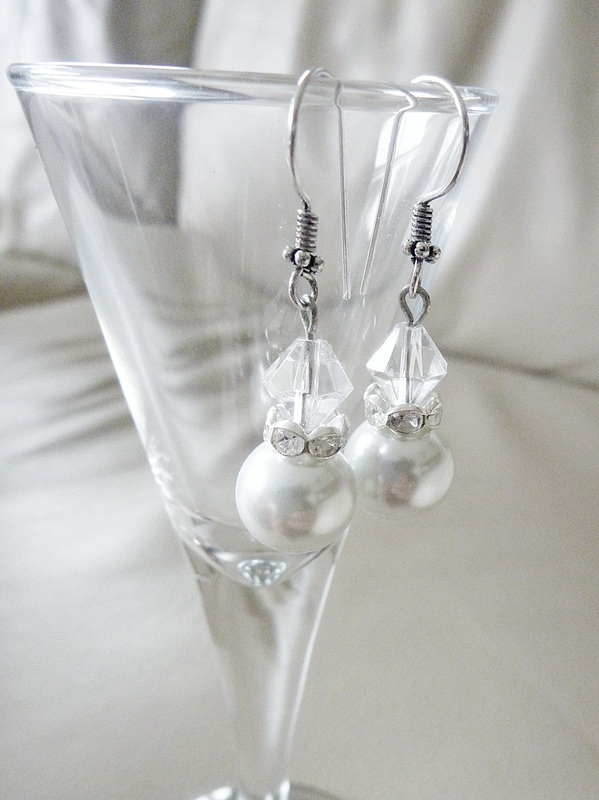 Glamorous for a bride or with your favourite LBD or just casual chic as everyday wear. 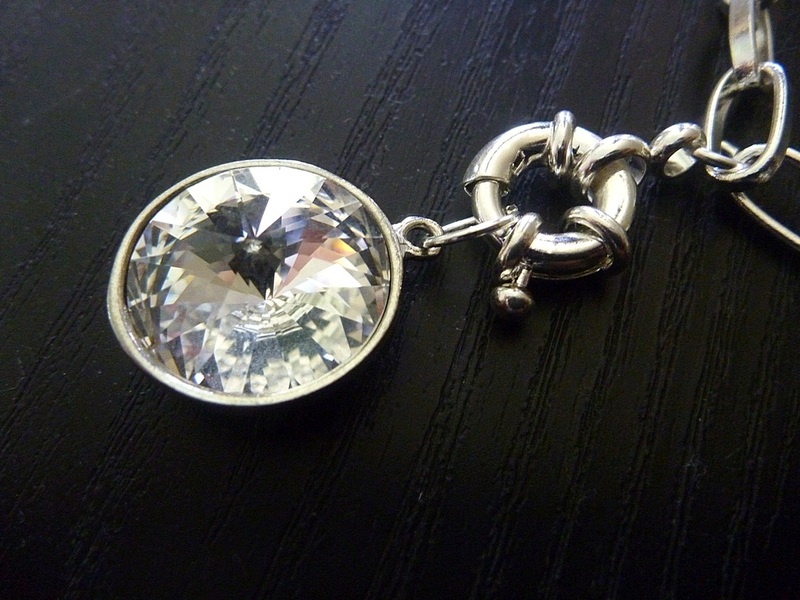 Stunning 12mm swarovski rivoli crystals. These form a peak front and back for extra reflective gorgeousness. 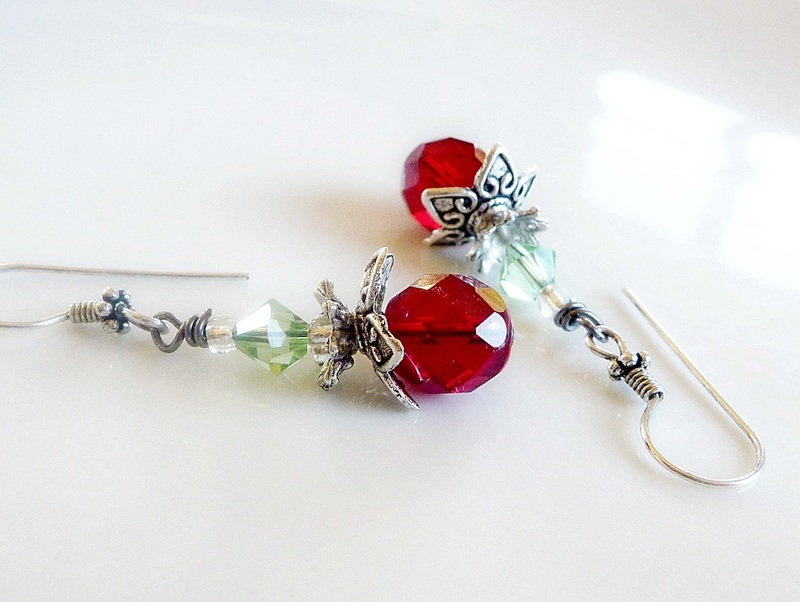 Nestled into purpose made pewter settings and strung on antiqued silver tone ear wires. total drop length from the top of the ear-wire is approx 3.8cm. The colour and sparkle are more intense than I can capture. Heliotrope throws many shades of blue, indigo and purple. 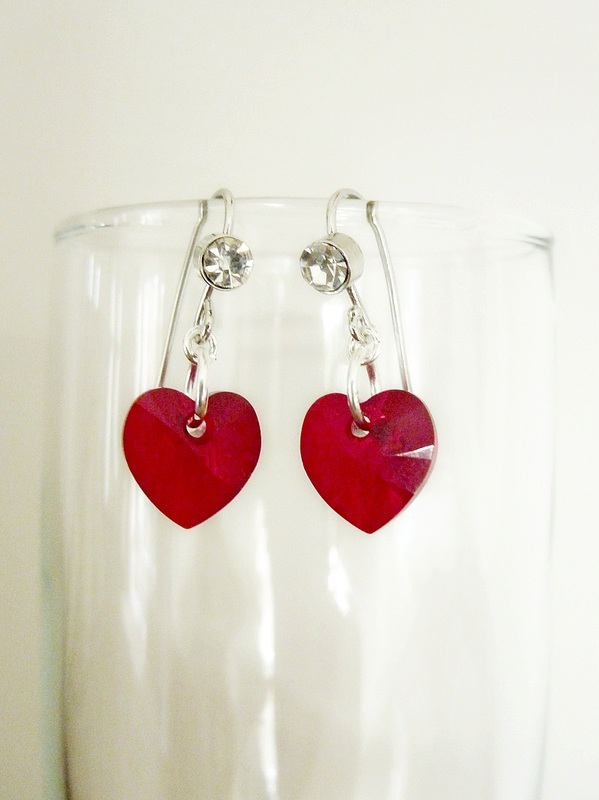 Also available in Sapphire Blue, Red or Peridot green. 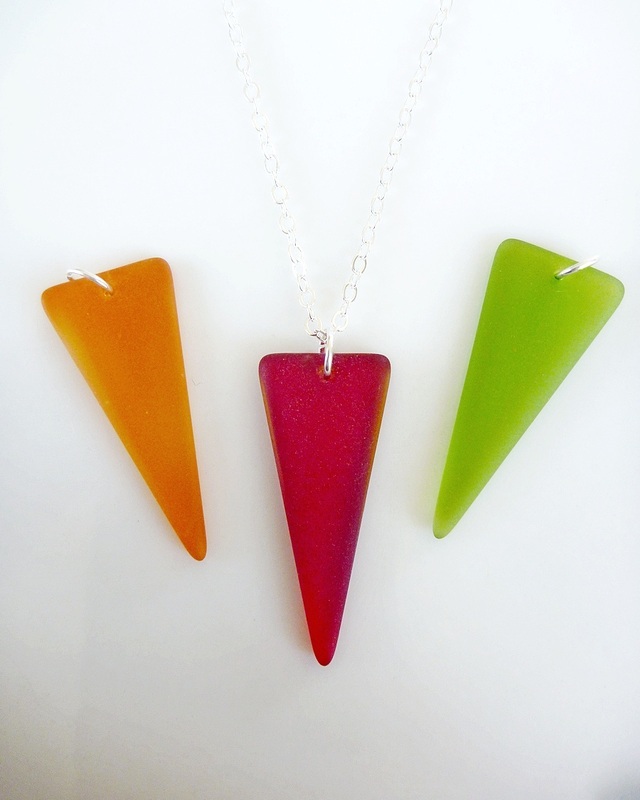 Just make your choice of colour at check out. Any questions contact me. 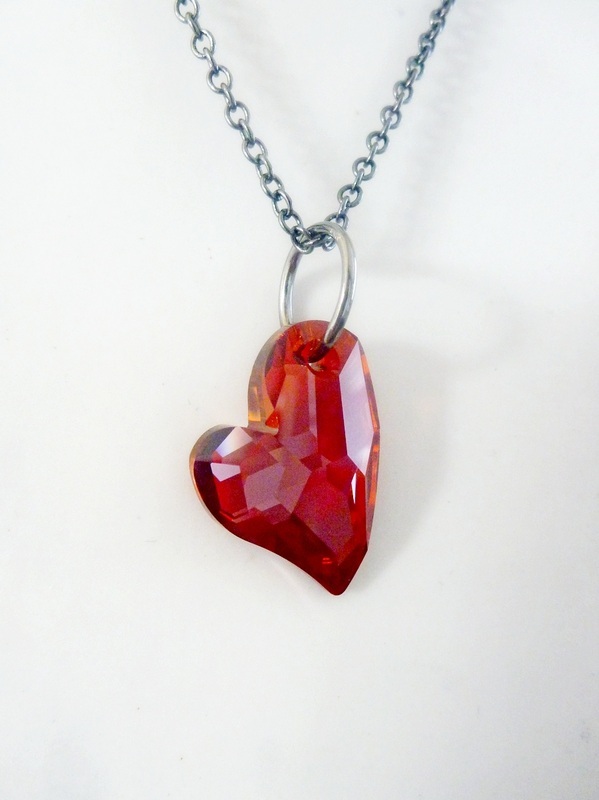 A breathtaking Austrian Swarovski heart in Magma Red - A deep bronzed red. 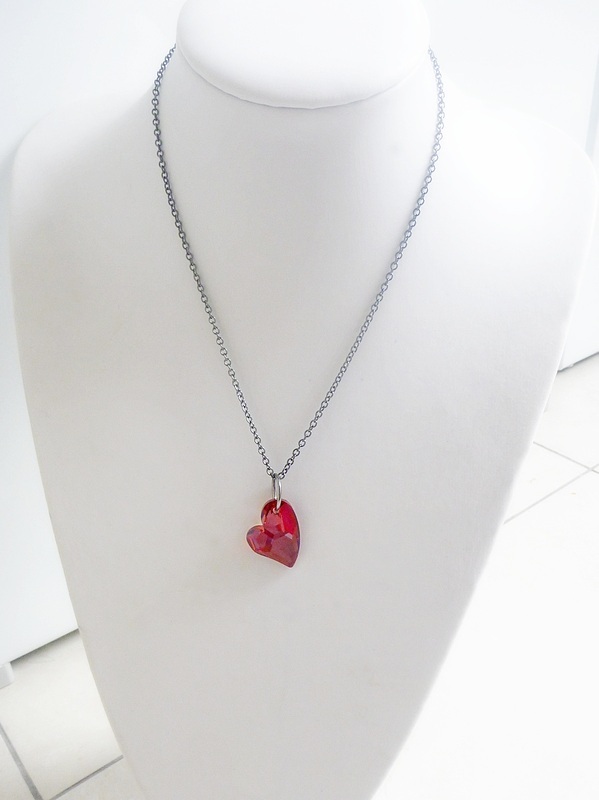 The heart is about 27mm long and the facets catch the light amazingly. I just can't capture the brilliance with my camera. I have strung it on an oversized jump ring and matching cable chain in either glossy gunmetal black or Platinum Silver tone. Choose your colour & length preference. This photo does not do it justice! 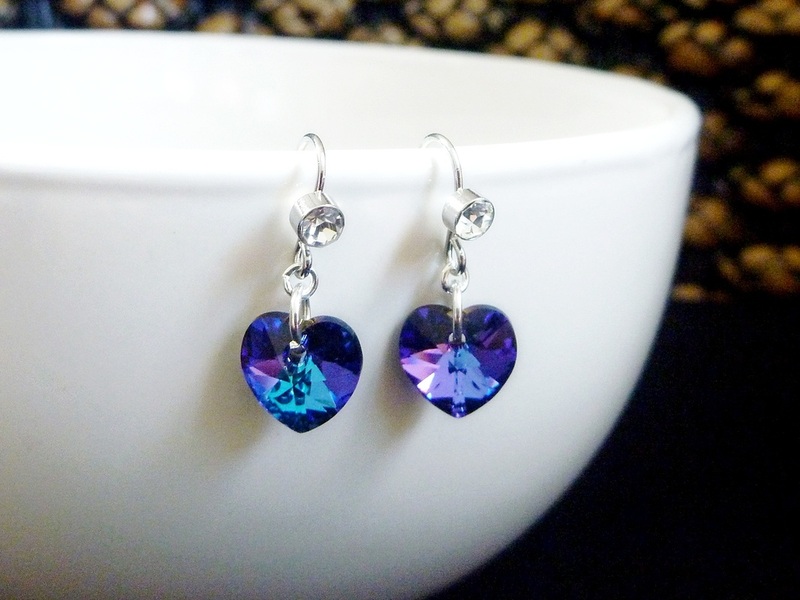 Stunning 10mm wide Swarovski heart crystals strung from lovely platinum plated ear-wires that incorporate a stunning wee clear zircon. The total dangle length is about 2.5cm. The colours given off by these Austrian crystals are incredible and much better than I can capture in photos. The Heliotrope versions change through many shades of purple, blue and teal. Truly stunning and stand out in their beauty.